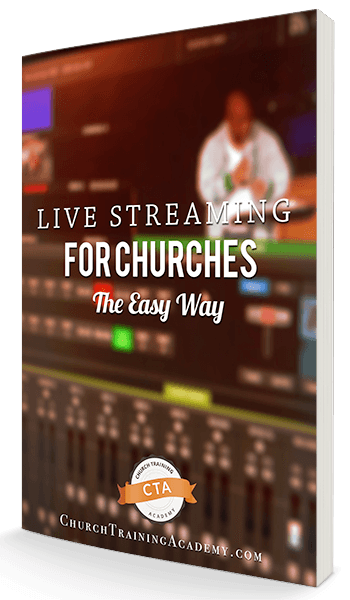 Is there such thing as a church that’s too small to live stream? Can you make an impact with a small following? 2:37 – Is 7 followers too few to justify live streaming? Today is the first episode of the Justin Nava show. We’re going to ask the question, is seven followers enough to have an internet presence? Should you be live streaming If only seven people are watching? I’m also going to uncover a secret about your church website that might be turning away visitors. This is a page that’s so important that so many churches get wrong and the question is, are you doing it wrong? And then also we’re going to nerd out a little bit. So welcome to the inaugural Justin Nava show! and welcome everyone. This is the Justin Nava show, the first episode, and hopefully not the only episode. if you don’t know what this is, my name is justin Nava. I’m with Church Training Academy and together with my partner Dave, we teach you how to use harness and exploit technology to spread your message, to spread the Gospel, to accomplish your mission online. Okay. We’ve been doing it offline for so long. You need some help doing it online. I hope you need help. And if not, come on the show and we’ll talk about it together. That’s what we’re going to talk about. That’s what church training academy is about. Well, we’re going to talk about on the Justin Nava show is the things that really, I’m passionate about. So if you don’t know, Dave is my business partner, he’s into the tech, he’s into the, I don’t know how to say it other than technical Mumbo jumbo. He’s the tech guy. That’s his stuff. My stuff is the strategy, the communications. And so we’ve done the church media guys show for over a year now. And if you’re not subscribed to that, go to your favorite podcast APP and subscribe to Church media guys. We’ve done that and we have our avenue there, but there’s some things that I want to talk about that don’t exactly fit in with church media guys. And there’s some things that Dave wants to talk. There’s a lot of things that Dave wants to talk about that doesn’t exactly fit in with the church media guys. So we’re doing our own shows and we’re also going to be experimenting because we want this to be a two way street. We want it to be a two way street where you guys can talk to me through the chat and you guys can talk me through the chat on facebook and Youtube. So for example, Tommy wants to know the Justin Nava show show, will there be dancing bears? No, Tommy, I’m sorry. maybe one day when our budget goes up we’ll be able to afford a little CGI bouncing bear that kind of bounces along the bottom. But the budget has to go up, which means we need to start the show and increase our listenership. Jordan’s watching Chris’s watching Ryan is watching and Ryan’s spoiling it already. He’s saying seven is a great start. So let’s get into our first topic here and the main content, the main beef of this, the main course, the main entree of this episode is asking the question, is seven followers enough to have a live stream and a social media presence? And, and okay, let’s just say this right now. Short answer. Yes, of course. Right? You can impact seven people, isn’t it worth it? The question really needs to be phrase though, because you can do a lot in your church to reach one person. You really can, you can focus all of your congregation on one person and it, it’d be a worthy mission, right? And you’re trying to save one person or you know, save their soul. but is that, is that a proper use of your resources? Right? if you take your whole church, the whole church budget to reach one person, could you be doing something more or something different to reach to people? Seven people, 10 people. I don’t know why I keep going to the number seven 20 people, a hundred people, right? You, you do as a leader. And so if you have this idea that someone’s against you, really, it’s probably a leader just asking the question, is this the proper use of our resources? So the other question is to go a little bit deeper. is seven followers enough to have a live stream or a social media presence? And I say seven, because every one of my businesses I’ve started, I’ve always gotten seven people to subscribe or follow and then they just stay there. and I don’t know what it is, but the number seven always sticks with me. Okay. maybe it’s just my parents, my wife’s parents and then my pastor and his wife and maybe one other person that’d be seven people that follow me all the way around. but there’s always seven people. And so the question is, you know, I think Sunday we had seven people live streaming our church live stream. I know that stuff costs money. So the question is, if you only have seven people watching, is it worth taking two volunteers on a Sunday, $1,000 for a camera, maybe 50 bucks a month for software? Is it worth it? and I heard a podcast, its called the marketing secrets show. Now this is a show, this is a business show. It’s a podcast, one of the top business podcasts. And, they had, they had a guest speaker on there called Sean Stevenson. And this was a recording from a conference a couple of years ago, but Sean answered the same. He asked the same question. he phrased it more like this. some of y’all are complaining that, you only have seven followers, right? And he, he said he’s a very positive guy, but he said, look at it this way. He said, that’s seven people. I’m going to clean up the language here. That’s seven people who give a darn about you. That’s seven people that care about what you say. That’s seven people that have decided to actively follow you, to hear what you have to say next. Now that’s, that’s kind of a big deal, right? That’s how I’ve always seen it. But he takes it to another level and he says, take those seven people that follow you. If you’re in church, this is going to be the seven people in your town, probably to take those seven people that follow you and put them all on a bus. Now imagine that bus got into a car crash and all of a seven of those people died in the crash. Maybe it ran off the road, right off a bridge and, and no one survives. Right? How much of a hit would that be for your town? How much, how newsworthy and how, how much despair and sadness would your town feel if those seven people just left the earth, all at once, you know, in, in a car crash, you know, you don’t want that to happen, but that kind of reframes it. Okay, so now it’s not only, okay, these seven people care about what we’re saying, now it’s these seven people would be missed if they were not here. These seven people would no longer be here to hear what we have to say and the, and that it would be on the news. There would be a memorial service, it would be in the newspaper, it would be all over social. These seven people matter. And so if you, if you have only seven people in, someone says only seven people watch, you know, the correct answer is yeah. Imagine if those seven people weren’t watching, how much more of a waste would that be imagined? Those seven people died tomorrow. I’m glad they watched today. That’s kind of a big deal. And so yes, seven people is not many. All right. Especially if you’re in a church of 100, 200, you’re talking about 7% and you’re like 7% is that worth, worth this? Hey, you have nowhere to go but up. Okay. Getting the first, in my opinion, seven as the hardest part, right? because everyone that really cares about your church, like really, really cares about your church is probably already there on Sunday. And if they’re going to watch on live stream, if there…people say all the time, oh, it’s a, it’s so easy to go to church online, you know, you lay in bed and you sit n your pJs, you sit in your pajamas and you put the live stream on and they’re just kind of sitting here and passively watching it. Do you know how hard it is to do anything productive at home these days? You’ve got Netflix, you’ve got games, you’ve got game station, you’ve got social media, you’ve got chores, you’ve got both parents working in almost every case and imaginable. And when they’re not working on a Sunday morning and they just haven’t slept in, there are so many other things to be doing than putting your church on the phone. Okay. I don’t think, and, and you can ask Dave this because two years ago I wasn’t sold on live streaming and he sold me on it. Okay? Jordan’s going to be happy to hear that because Jordan’s a total dave fan boy. He’s in the comments asking, when’s Dave show? Dav’es show is coming, Jordan. It’s not the time right now, but there’s so much other things to do, on your phone and in your house and to pull up a church online service that that means something. Okay? This is not some lazy cop out. This is someone choosing your church over Netflix, someone choosing your church over Mario. This is someone choosing your church over cooking a big fat breakfast, right? Eggs and pancakes and all that. By the way, if you ever make pancakes from scratch, it takes a long time because he got to sit there and cook every pancake, they’re choosing your church over these things that they could easily be doing in your house. So yes, that is a huge accomplishment. Two views, Three views, seven views. It can only grow from there. Another thing that you’ll see a small church having a big impact is this. I’m going to pull up a picture here on my computer. You won’t be able to see it because I didn’t load it into the, into here, but I’ll read it to you. Last Sunday we were live streaming our church service at my own church, First baptist Edinburg. And you can go into the, into the the facebook profile and you can see the live stream. You can see the comments. So I’m not making this up. we had, a woman ask a question based off of something that we did in church. We have a membership at our church, a membership role. And in order to become a member of the body of, of our church, you have to go through a membership class. I just found out we’re not members. What do we have to do? This is someone that was at home thought that the church stream was more important than whatever they had going on at home and not only that cared enough about our church to actually put a comment again… How much stuff do you scroll through on your phone and you’re like, that’s nice and you may not, you may not even drop a like right. You may not even hit love or hit an Emoji or comment. You’re just scrolling and say ha and you scroll and Scroll. Oh that’s cute. And you’re scrolling. Maybe you say, Oh hey, look at this, but you don’t actually engage. Engaging is a huge thing that we need. Someone out there wants to connect with you. So, so this woman said, we’re not members. What do we have to do? And quite easily I said, hey, we’re going to follow up with you. I had her name right and worst case I could send her a direct message. I said, we’re going to follow up with you on our next class. I did find her contact information and a Deacon is calling her hopefully this week. Not only that, someone else, a very wonderful woman who’s a member, her name is Natalie. she said, hey, original commenter talk to Carlos. he’s our deacon. I believe in March there will be another new members class. It’s really good. So in this livestream that we may not have had if we thought seven people were too few for… cause it took two of us to get the live stream up yesterday. So for the manpower and for the budget of a camera and the software, because of that investment, someone at home saw how they need to take a next step in their journey and join the church that they know they’re not members. Maybe they figured out, oh, maybe they had that light bulb come off. God turned it on. Excuse me, light bulb turn on. God turned it on and said, we need to become members. What do we have to do? They’re at home though! And they’re not going to wait a day to email or two days because it was a holiday to get an email back. By then, they’re probably not going to care anymore. You want to, you want to hit them in the moment. And the way you do that is of course you comment, this would not have been possible. She would have not noticed that, that piece, that membership missing in her journey and her in her belief. And not only that, another member got to speak into her, and got to pour in to her and say, Hey, talk to this guy. There’s gonna be another class soon. It’s really good. And now she has that social proof that, that social proof that, okay, someone else is saying that this is okay. Not just the guy from the pulpit. You know, the guy who’s supposed to be there. If someone else that’s watching online and says it’s really good as social proof, this would not have happened if our church had said seven people is too little. It is important. Live streaming is important. So the question is, can a small church have a big impact? Yes. Because you never know what’s going to happen from your impact. My whole journey started with my great, my great grandmother. It started with my grandmother. She picked me up from church, excuse me. She picked me up from home to go to church and then she took me back home. Then she moved away and my great grandmother, my grandmother, her mom would then drive across Houston, not across Houston, but she would drive past the church because she lived right by the church. She drove past it to pick me up and then drove back to take me to Sunday school in Church and then she drove me home and then she’d go back to her house by the church. Small, I mean small impact, small bananas, but now I’m here talking to you because these two women did something, something like that where they just picked me up every week. I mean, you never know what the, these little things are going to have an impact. Tommy says if people would rather lay in bed and watch a church service, they are not interested in learning. They are not interested in learning about God. If someone wants to attend church but can’t live streaming is very important. So if people would rather lay in bed and watch a church service, they are not interested in learning and God, are you sure about that? I would say they are interested because again, they have, they have so many things that they can do, but they’re choosing your church live stream. They’re choosing to give your time to them. Maybe even if it’s in the background cooking, they could be watching the simpsons in the background cooking, but they have your church on it cause they want it, they want it. They want to see what you’re about. Okay. So yeah. Live stream is… And I’m talking about more because I think, when, when you live stream for the people that can’t come, that’s kind of obvious, right? They can’t come. So they will live stream. I’m talking about the people that can come, maybe chose not to, but they will make that small micro investment to live stream and see what you’re about. I think that’s huge. next we’re gonna talk about your church website. So let me, let me know what you have a thought. leave. Leave a comment down below and how appropriate we have seven people. We have seven people live streaming on facebook right now. but before we get to, I’m going to talk about the, the page on your web church website because there is a certain page on your church website that almost everyone will visit. It’s the second most visited page, and if you do it wrong, if you do it bad, we’re going to talk about that. You will totally drive people away. Okay? it’s kind of like having a weird smell in your church. When you walk in, you’re like, oh, what’s that smell? We’re not coming back for that. You know what I’m saying? It’s, you don’t want to have a smelly webpage, but first I want to tell you about live streaming the easy way. This is a guide that Dave created to get you live streaming faster. Okay? 2019 is here. We just got done talking about live streaming and we even said seven people. That’s plenty of people to start with. A live streaming audience. So if you think you have seven people, just seven, just five, three, two, okay. If you can get those people consistently, live streaming is something that you should really look into and it’s not a huge $20,000 investment anymore. You don’t need five volunteers with video switchers and cameras everywhere. You don’t need the big production. And Dave has laid that out in the live streaming, the easy way guide. So I want you to go to your web browser, to your phone, go to www.easylivestreaming.com we’ll have a link down below in the show notes. Easylivestreaming.com to get your free guide. And it’s going to show you four ways that you can start live streaming. And no, we’re not talking about cameras, we’re not talking about well we are talking about cameras. We’re not talking about expensive production equipment. There are four ways that you can live stream. Two of them you can do right now, so we can, that’s easylivestreaming.com yeah, so Ryan says he reports his ten second unique views. Concurrent runs about 80 across all platforms. They started with super low numbers just two and a half years ago and yeah, and you only have room to go up. Ramon chimed into, I think the church that live streams needs to get people watching involved. That’s right. Ramon live streaming is just a starting place, right? You don’t want to let people get complacent. It’s kind of the same thing with people in church, right. If you ask me, I’m going to say something, kinda daring is someone who sits at home and live streams, and it doesn’t come to church versus someone that comes to church sits down and just checks off a box for the week. Like okay, I did it, I’m good. And then they’d go home, maybe not talk to anyone on their way in or out. Maybe begrudgingly shake a hand during the greeting time. To me there are about the same. Okay. Either way, they’re not really getting involved. They’re there to say they say they were, you know what I’m saying? You want to always push people to the next level. And when I say push, I mean sometimes it’s a pull, right? It really is a pull because you’re saying, hey, come with me right now. Not, hey, do this now. Okay. But it’s, it’s a live stream is a good place for people to get comfortable with maybe the music, maybe what to expect. Then you can nurture them into a visit, right? Because you’re being active, you’re being engaging, you’re asking questions in the live stream and then you nurture them into a visit and then can pull them in to you more. But right now I want to talk about church websites. Your church website has a page. On all my clients It’s the second most visited page. Most churches have this page, but many, many do them so wrong. And that’s going to introduce my new segment, the good, the bad, and the ugly. And eventually I will have a little bumper that I play here, but you know, one, one step at a time. We had a killer intro. So I’m just excited for that. On this segment of good, bad, and the ugly. We’re going to talk about good ways to do things, bad ways to do things, and the ugly way to do things. And unfortunately the ugly way to do things is what a lot of churches choose to do. The webpage I’m talking about, the one that visitors will go to, web visitors will go to and decide whether or not they’re going to go to your church. The page I’m talking about is not your ministry page is not your contact page. It’s not even your plan, a visit page, it’s your staff or leadership page. This is the second most visited page on my client websites and on most church websites I’ve talked to other church website designers, and developers and yes, it’s the staff page or leadership page, whatever you want to call it. This is the second most visited page. Why? Because people want to know, frankly, are y’all going to get along okay? And in my, in my impression, they want to know, are these people crazy? Yeah. in my experience, this is the hardest hurdle to overcome when witnessing or ministering to people that are lost. is first just convincing them that you’re not crazy, that is the first thing you need to do. And that is most often accomplished by the leadership page. I love that you guys are still talking about the live streaming. Go ahead. Keep talking about live streaming. I’m talking about websites right now and if you, and if you’re listening to this after the fact on the podcast or the Youtube Fridays or excuse me, Tuesdays at 11:15 we’re going to live stream the recording here. So just, you know, tune in and join the conversation. So the staff page is basically the place where you can convince people, hey, we’re not crazy. We’re just like, you we’re normal people, you know, you can trust us, right? You can, you can connect with us. So we’re going to talk about the good, the bad, and the ugly. The good. Let’s start with the good. Okay. A staff page is not a place for you to plaster pictures of your, staff or leadership and then tell whatever you think they should know about you. Now remember it. Your web experience starts with your visitor. Okay? This is the person you’re trying to reach to. What is, what do you need to convince them that you’re not crazy? Just let them know what you like. That’s it. That’s all you have to do. What do you like? What are your hobbies? you know, when did you come to this town? So that’s it. The good staff page. Ready? Write this down. Bullet points. Here we go. What’s a good staff page? Include? Good pictures, good clear pictures of your staff. And I say staff. It could also be leadership because smaller churches don’t have staff. They just have one person on payroll and then the rest are volunteers. And that’s fine. Leadership page, interchangeable. So you have pictures of your staff. You put their name, their job title, bonus points, put their job description, but use it in layman’s terms. Okay? Do not say that. You know, my name is Tim and I am the pulpit supply. What is a pulpit supply? Click right x out. Let’s find another church. I didn’t even know what a pulpit supply was until our church had it, which by the way, it’s the person who preaches, but it’s not the pastor. So if you, if you have a pastor, but maybe they’re more of the shepherd and counselor of your church and someone else’s preaches on Sundays, that’s the pulpit supply. Maybe you don’t have a passenger in an interim period. That’s what we were. And you have someone that comes in, preaches, but really, you know, they preach on Sundays and that’s it. They don’t really have a pastoral or shepherd rule. They’re are a pulpit supply. No one knows what that is outside of the church. So you need to use layman’s terms. What does a pastor do? What does a children’s director do? What does a minister of creative arts do? Because again, someone from outside of church might see that and say they’re paying this guy to be an artist. What does that, what does that mean? Right. You got to use layman terms. So I’m minister of creative arts job description. I make everything look good and run on time. Like, that’s easy. I can understand that. So good profile, picture, your name, your title, your job description in a way that people can understand and then include four to five hobbies that you have. Okay. On my church’s website. We have a favorite movie, favorite book on the weekend you’ll find me fill in the blank, right? Watching the movies and hanging out with the kids, traveling, whatever. favorite place in town. I liked that question a lot because you get to kind of connect with your people. Oh, he likes Delia’s. Tamales. I like Delia’s Tamales, which by the way, if you’ve never been in south Texas, Delia’s Tamales, this is the best tamales you’ll ever have. But that’s how you connect with people. Okay? So that’s a good staff web page. That’s what you want to strive for. The bad is what we see more. which is basically just pictures and academic bibliographies or academic academia, history. I don’t even know what it is because it is, it is. So… The verbiage is beyond me. This is where you have a picture of your pastor. And then it says, pastor, so and so graduated from Umhb and t in 1968, and then pursued a doctorate of divinity at Dallas theological seminary in 1972 and he’s been published and pastors weekly magazine. and in 1988 he spoke at the… Dude like, you are accomplished. I get that, but that does not make me feel like I can trust you. Okay? That does not make me feel like I can relate to you because I’m just a plumber. Okay. I’m just a plumber looking for a place that maybe can fill this hole in my heart. But you’re talking about doctorate at divinities and I have no idea what that even is. What is it? What is a doctorate at the vin… I don’t, you know what I’m saying? So you need to put something, but if you put in, you know, hey, this is pastor, he loves to hunt. Hello. Hey, I love to hunt. So I will go with you and I will go check out your church because you’re obviously not crazy because in my opinion, as this hunting plumber, only crazy people think hunting is wrong. Okay? That’s not my views. And this is what your visitors are thinking now. that’s it. So the bad is having your pastor picture and then maybe like a, a long bibliography or, I’m probably using that word wrong, long biography. That’s, that’s not what you want. Okay. The ugly. And this is more of something that’s, you know, I’ll know it when I see it, kind of thing. The ugly is when you, put your pastor on a pedestal. Okay? this is when your pastor’s profile is so much bigger than everyone else’s. Your pastor gets three paragraphs of everything they’ve ever done at the church. You know, he sneezed on January 3rd, and the Lord came into the church. I’m being facetious here, and then maybe you’ve got other staff and at the bottom it just says Alicia, David, and Jr, right? That just looks like your pastor’s a king. Okay. And now you’re not doing this on purpose. Okay? Churches do not do this on purpose. This is not their intent. Maybe they saw it on another church website and they said, if it works for them, it’ll work for me. Right? But that’s like watching me workout and say, well, I’m going to do that. No, you see me, I’m not the one to model working out. Okay, you got to model the good people. So that’s what I’m telling you. The good, the bad, and the ugly for your church staff page. You know, make it relatable, number one. Number two, don’t use words that unchurched people will understand. And three, do not elevate your pastor above everyone else, at least so far above everyone else that it looks like they’re worshiping the pastor and not not the creator. Does that make sense? Next, we’re going to get to what I’m nerding out about. we are running up on time because I did want to keep this around 20 minutes. First I’m going to tell you about the ultimate Church website blueprint. So we were just talking about your church website and your staff page. We spent a few minutes on it, probably more than I wanted to, but I want to tell you about the ultimate church website blueprint. This is our course inside of Church Training Academy. It was our first full course that we launched just to insiders. And this is where you can learn how to build your home page, how to build your plan a visit page or staff page, your ministry pages, your contact page, your gift page, and then how to get started with search engine optimization. So you’ll rank higher in Google. All of this is inside, the Church Training Academy members area. Okay? This has been locked away in there. It will be coming out to the public for purchase in February, but I have to warn you, a, it’s going to be more expensive than the membership because that’s just the way the course should sell for. It’s, it’s a very, it’s the best church website course you’ll find. Okay. If I may say so myself, but two, you can get into Church Training Academy right now for $27 a month. Okay. or I think you should pay for 11 months. You get the 12th month free. That price is going up on February 1st and February first at midnight. That price goes up to $37 a month. It’s going to go up because me and Dave are going to be providing even more to you one course every month. you know, more, more resources, checklists, task lists, workbooks, whatever you want to call them for our members. And to do that, we have to raise the price. So go to churchtrainingacademy.com/join when you join today, you’ll lock in that price for $27 a month. You’ll also get access to the ultimate church website blueprint right now, which no one else will have access to remotely until February. So you’ll get a headstart and you can start building that out. And guess what? That website blueprint, it’s good for any website, whether you use wordpress, squarespace, wix, it’s not… You’re not going to buy the course. And it says, Hey, go buy my wordpress course. No, I hate that. It’s not that. Okay. you can use it with any price. So the price goes up in February. you got less than two weeks. Churchtrainingacademy.com/join. If you have any questions about what church training academy is, just put a, put a question in the chat in the livestream and you know, the other insiders, will answer it for you. Okay. Levi says, what web hosting sites are you guys using for your church? Mine doesn’t have one yet, but we want to make one. Dave will come up. Dave, we’ll, we’ll come back to you on this. I know Dave has a special one. I don’t deal with hosts personally in my business. I host my own websites, through my own services, but Dave will come back and answer you Levi. So, so come back for, for a, for an answer. Tommy says this is good, informative show. Thanks Tommy. Because now we’re going to get to what I’m nerding out about. So this is the part where we just ditch everything that we just talked about. We’re not ditching it, but we say, okay. We talked about the informative stuff. Now let’s talk about the nerd stuff. And today I’m just going to give you one thing. Yesterday I went and saw Aqua Man and it was… On a scale from zero to 10 zero being the worst movie ever, and 10 being the best movie ever. It was right around, it’s pretty good. It’s pretty good. So that’s my rating of the aqua man review. Why? Because it looked amazing. Let me start with the good stuff. It looked amazing. Oh my goodness. I thought it was going to be cheesy. You know, it was all going to be underwater. I thought it was gonna be terrible. Okay. I thought it was going to look bad, but they nailed it. Okay. The audio was a little tweaked out because they were trying to make it more boomy, you know, like you’re underwater talking. But aqua man pretty good. Okay. Where it fell short for me was a, it’s very paint by numbers and I know I’m a marvel guy and marvel is very guilty of paint by numbers. Okay. But aqua man even more so it came to the point where the woman next to us, I would guess in her fifties, the couple next to us, even she was saying lines ahead of when the people would say lines. Okay, you know, someone be like, what are you some kind of aqua boy or, and, and then he’d be like, Oh, I’m aqua man. And she said it before He said it, Jason Momoa. and, and it got kind of annoying cause she did it like four or five times. There’s also a certain way they treat surprises that’s very predictable and by the second or third time it happens, you’re like, dude, again, just finish the sentence. and then also personally, there’s one spot in the trailer that spoils the b plot of the movie. Okay. If you watch the trailer, there’s like one split second hint of, of what happens or aqua man a shot of aqua man. And it totally, it totally spoils like half of the movie. So that, that really messed it up for me. But, so here’s what I’ll say for a DC movie, it’s really good. Go Watch it. If you want to see a good dc movie for a hero movie it’s pretty good. It’s pretty good. So that’s, that’s what that is. So, that’s my review of aqua man. Something else I’m, I’m nerding out about and this is serialized podcasts. I come from the world of, I’ve always listened to podcasts as… another way to get information. Okay. This is where instead of reading a book, I’ll listen to a podcast. Instead of reading an article, I’ll listen to a podcast. Podcasts have always been for information for me. I started listening to serial podcasts, which there are podcasts that are more episodic. They have a beginning and an end. they do seasons. Okay. And so I got started because someone recommended a podcast called the dream. This is all about multilevel marketing and how it got its start, how it works now, how the promises aren’t all that they are up to be. And I got hooked. I really was. I was like, wow, I didn’t know they could make shows like this for podcasts, for audio. Really enjoyed it. I will say this one disclaimer, I think it is worth the listening to and is worth the subscription. However, the last couple of episodes, the creator, the host, I just call her a host. She gets very political and her leanings get very obviously in the way, kind of ruined it a little bit, but the first eight or nine episodes solid, something else from that company, I believe it was npr, is a podcast called believed. And it’s all about, Larry Nassar, the Olympic guy, the Olympic health guy, the joker, that abused a lot of the Olympic athletes. And then it came forward like 200 women came forward and said, this guy’s no good. And he hurt me in the past. It was amazing to see, you know, they dug into the history and they dug into the interviews and the police files and said, this is how he got away from it for so long. This is what he said to trick people. This is what people didn’t investigate. This is what people missed. This is what he hid. This is how the parents acted That caused him to be able to do it again and again and again because the parents didn’t take the children’s seriously. And I know I would listen that I was like, are you kidding me? But the way they present it, it’s real tough. It’s real tough. so this is a great one. It’s called believed, believed. The other one that I just started that I am, I am loving more than any of these is marvel’s wolverine. Marvel came out into the podcast last month and it’s a story based podcasts it’s the story of Wolverine, Hugh Jackman in the movie. and it sounds wonderful. It sounds, I mean they have, when you have headphones on, it sounds like you’re listening to surround sound. The voice acting is professional the soundscaping is amazing. You can hear people walking, you can hear people talking based on if they’re on the left or the right of you. If someone’s calling from another room, it sounds like they’re actually in another room. It, it truly is, truly is amazing. So, that, that’s what I’m nerding out about right now. I’d go into it more, but we have reached our time. Again, this is the Justin Nava show. If you’re watching on youtube, hit like if you’re listening to the podcast, hit subscribe. If you’re listening to it, on our facebook hit, like hit follow, hit share, do all those things to get the word out because this is going to be, sorry Dave, this is going to be my favorite show cause we’re going to talk about the stuff that I’m nerding out about. Couple of things you can look forward to. it’s not just going to be me talking. I’m also going to go over what other people are saying in the church media space, things that can help you, things that maybe are out there that are wrong, that you need to know, hey, before you do this, don’t expect these results because you’re not going to get them, right. Well, you’re going to sacrifice your message to try to do it this way. Okay, we’re going to talk about that. We’re going to bring in other resources. We’re going to bring in news clips, video clips. We’re going to bring in other things. The interviews will be saved for church media guys. and of course we’re going to bring in some more production, some more video bumpers, some more sound effects possibly. thank you guys for watching Levi. Yes, Ramon is right on point. Siteground, I’m going to put a link there. It’s an affiliate link. You’ll, you’ll, you know, we get a couple of bucks at no extra cost to you. so thank you guys for watching. Siteground is an amazing host. We’ll have the link down below. this is the Justin Nava show, episode one, small church. Big impact. Thank you for watching. God bless everyone.